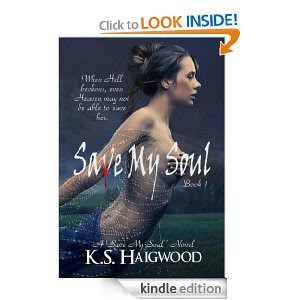 Save my soul is a book about good versus evil. Guardian Angels against Guardian Demons. You have Kendra who had an accident while climbing with some friends. She was on the brink of death. Adam a surgeon was doing it best to save her life. That is his job after all. Little did he know that his miracle hands didn't work it was a Guardian Angel. Kendra made a deal with Adam's guardian angel. In order for her to live she had to help Adam believe in God again. Yes when I read that I was hoping the author wasn't going to push religion on the reader. That surely didn't happen. Kendra who is a photographer had a week to make Adam believe. She really didn't know why Adam didn't believe in God until Adam showed her. It hit her like a ton of bricks. Kendra tried explaining to Adam that she only had a week and if she didn't succeed then they both would loose their soul. I love a good angel book. This book not only had angels and demons, it had romance. The demons didn't look like demons they looked like every day people, they didn't look ugly at all. In fact Mason was very handsome and woman were drawn to him. On her weeks adventure to help Adam believe in God. Her guardian angel Rhyan helped her when he could. The higher powers only gave him so much leeway. Rhyan wanted Kendra for himself. When he was assigned to her he fell in love with her. In a way he wanted to help but then he didn't want Kendra falling in love with her soulmate, but he knew if he didn't help as much as he could her soul would go to hell and not heaven. As the book progressed the pieces were being glued together. All the pain in Adam's life was done on purpose because he was getting closer to his guardian angel, something Mason couldn't let happen. What did Mason do to Adam to make him stop believing in God? I am not going to say. I will say it is a good read. There isn't a part where the author says you have to go to church to go to heaven because if you don't you will go to hell. There was adventure, mystery, romance, and crying. Yes I shed a few tears toward the end. Like I said as the book started to wind down pieces were put together. You have to read if Adam believed in God again. If Kendra saved their souls. Did Kendra actually fall in love with Adam? I would recommend this book to my friends.